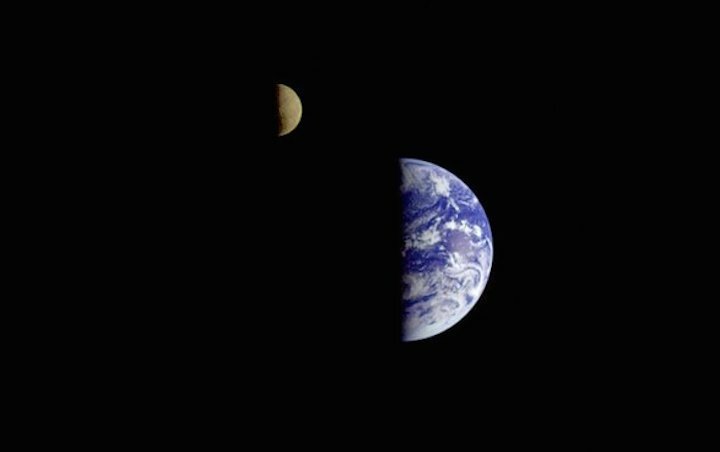 Having spent the better part of a decade looking out from our solar system to survey the Milky Way’s population of exoplanets, NASA’s Kepler space telescope is easing into retirement by turning around and taking a photo of home. On December 10, if you look near the constellation Capricornus, the aging, venerable spacecraft will be gazing back from some 100 million miles away. To raise awareness of the event and as a kind of tribute, some astronomers have started a “#waveatkepler” social media campaign—hoping people around the world will pause, look up and salute the space telescope that since its launch in 2009 has revolutionized astronomy with its search for Earth-like exoplanets. From the thousands of worlds Kepler discovered, astronomers not only found a few that may be similar to Earth; they also made some profoundly far-reaching conclusions. For one, we now know that on average every star in our galaxy has a planet, and the typical world seems to be larger than Earth but smaller than Neptune—a sort that is strangely absent from our own solar system. But after all that productivity Kepler has been on its last legs for years, hobbled by hardware failures. A mission extension dubbed “K2” devised new ways to operate the crippled spacecraft, giving it a momentary reprieve. But the journey is now reaching its conclusion as fuel supplies dwindle. Within six months to a year NASA mission planners expect Kepler’s life to end. But the image will not be something you print out and hang on your wall, Davenport says. Like an overexposed photo of the sun snapped by a smartphone, Kepler’s picture of Earth will come out as a bright blob. In fact, he adds, “Kepler is maybe the worst possible setup for taking this photo.” The telescope was designed to look for planets around stars that are thousands of light-years away, so it has a large exposure time—30 minutes per shot—to soak up as much of that dim light as possible. It also has a very large field of view, meaning it can image many stars at once, but that expansive perspective comes at a cost—the resulting pictures are low-resolution and grainy. And so, for most of Kepler’s mission its scientists have deliberately avoided pointing the telescope at our solar system’s planets, thinking they would only be bright nuisances. So why bother imaging Earth now? Much about this interplanetary glamour shot comes down to coincidence, and the fact Kepler is used to study more than just exoplanets. NASA had already decided to point Kepler’s camera toward the front of its orbit on December 10 to look for supernovae; Earth just happens to be in the field of view for a few days as a bonus. This photobombing occurs because Kepler is in an Earth-trailing orbit, which means it slowly follows Earth around the sun, gradually spiraling farther and farther away from our planet. It is usually turned away from us and out toward the path it already traveled, facing a direction that Earthbound astronomers can only briefly scan at dusk because of the impeding daylight. On December 7 NASA astronomers will switch the camera around so it looks forward, allowing them to observe the same patch of sky from the ground at night. For the next 80 days, Kepler and ground-based telescopes will monitor over 9,000 galaxies for an expected haul of between 15 and 40 supernovae. Earth will be in Kepler’s field of view for the first couple of days. “We had this opportunity to look at Earth, and while that’s not what drove our decisions, an awful lot of science results that we get out of K2 are serendipitous,” says Jessie Dotson, K2’s project scientist at NASA Ames Research Center. Prior to the snapshot the K2 team will take 10 hours of additional data, watching as Earth moves across a single strip of pixels in Kepler’s detector. This information could help astronomers correlate our planet’s changing brightness with its rotational rate—that is, the length of its days. Dotson does not think this will be mind-blowing, but it could be interesting. “If you kind of imagine you squinted at Earth,” Dotson says. “If you’re looking at it from this side, it’s shinier than if you look at it six hours later from this other side. That’s the kind of level of information we’re going to be getting.” Tracking similar brightness changes on some faraway exo-Earth could eventually reveal the length of its day, too. That view, in turn, is a poetic reminder that “we’re all together here on this planet,” says planetary scientist Erin Ryan at NASA Goddard Space Flight Center who with Davenport co-founded the #waveatkepler campaign. This poetry resonates through other astronomers as well. “It’s kind of enchanting to think that you’re waving and looking out into space, and at that moment something out there is looking back at you,” Laughlin says. A few months after Earth photobombs Kepler, when the data finally downloads, the image will show a low-res, grainy, unassuming planet 100 million miles away—hiding a world of people looking up at the sky and waving.